(L-R) Christine Larkins, Marissa Gredler and Kelsey Lewis are members of the research group that works in Marty Cohn’s lab at the University of Florida. Marty Cohn’s lab at the University of Florida looks about like any other lab. Goofy cartoons on the walls that may or may not reference the lab’s field of research. Pipettes and plastic containers lining the shelves. A small aquarium housing shark egg cases. But after a few moments, it becomes apparent there is something is unusual about the Cohn lab– almost all of the researchers are women. He says he looks for three characteristics above all others– you have to be nice, you have to be curious and you must possess a tremendous work ethic. This has resulted in a staff of 19, of which 16 are women. 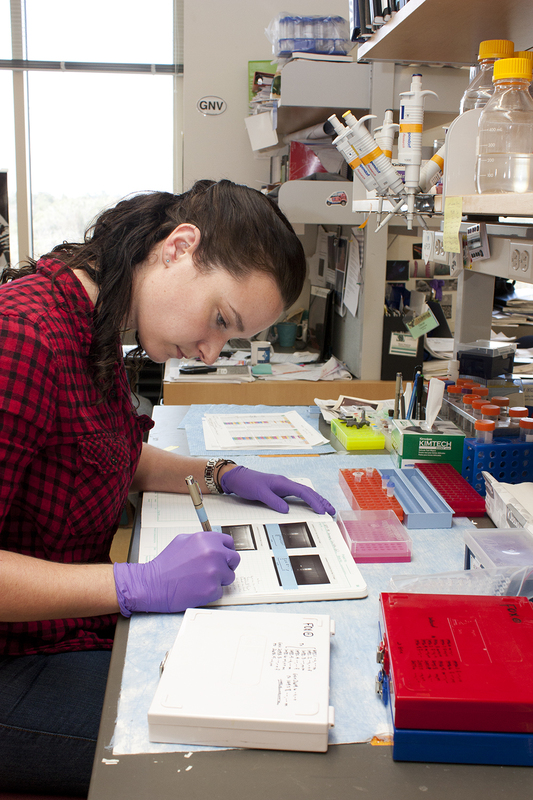 Kelsey Lewis works with a micropipette in the Cohn lab. The women in the lab aren’t sure how the composition happened either. Earlier in his career, Cohn focused on limb development. Since then, his lab has expanded to focus on evolution and development of various appendages, including genitalia. To them, a lab full of women studying phallus development is nothing out of the ordinary. But, every once in a while, they find themselves out with people who are not research colleagues, trying to explain what they do for a living. 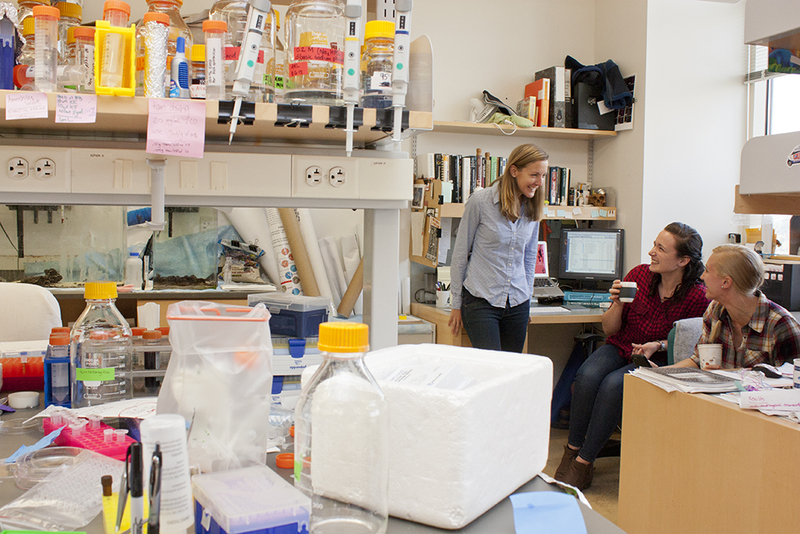 “When we’re out at a bar, and we try to explain our work to people that aren’t in the lab, that’s when we have difficulty,” said Marissa Gredler, who joined the lab in 2008, and received her PhD in 2015. Larkins, the soft-spoken elder stateswoman of the group, decided to pursue a research doctorate after an undergraduate adviser suggested it would suit her better than pursuing an MD. She joined Cohn’s lab as a post-doc in 2011 after getting her PhD in cell and developmental biology at Emory University. “I enjoy the lab environment– the independence, doing research, reading papers and finding new questions to answer,” she said. (L-R) Kelsey Lewis and Marissa Gredler work on research projects. When Larkins was looking for post-doc positions, she was intrigued by Cohn’s focus on evolutionary biology. Now she studies sexual differentiation of the urethra– how hormones contribute to forming external or internal genitalia, and how birth defects arise as a result of that process being disrupted. Roughly 1 in 250 infants are born with a genital malformation, according to figures from the Center for Disease Control. It was only half-a-year ago ago that biochemist Tim Hunt made his boorish assertion before a conference for female journalists and scientists that co-ed lab environments are inevitably complicated by romantic entanglements– that women researchers unfailingly respond to professional criticism with tears. He was immediately encouraged to resign, but his censure was met with resistance by others who remain in the field. 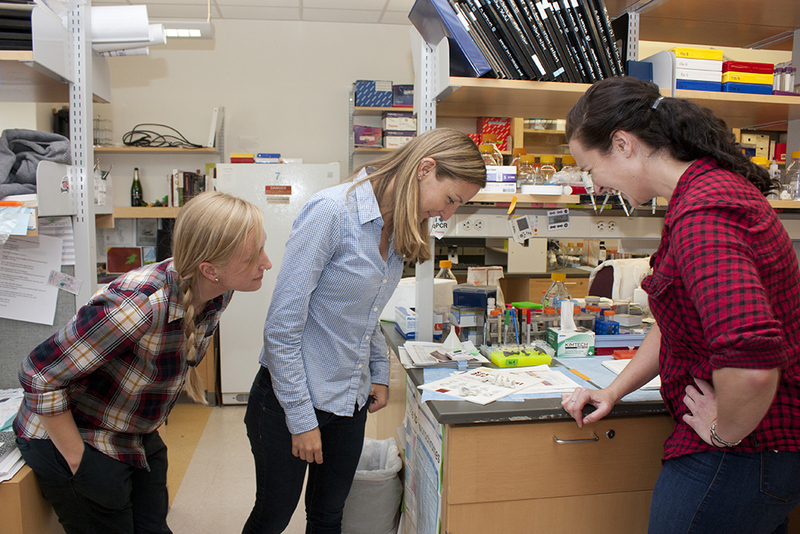 For the ladies of the Cohn lab, their workplace is an oasis of equality. 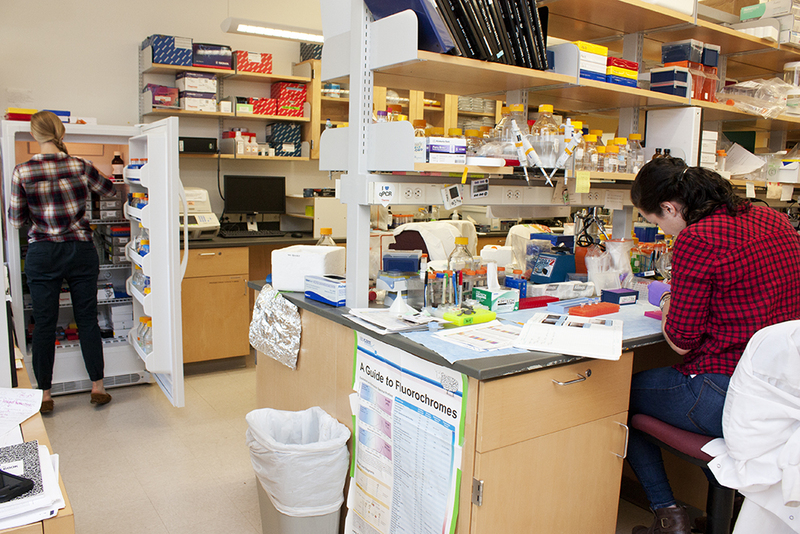 Marissa Gredler records her research in the Cohn lab. However, they haven’t spent their entire educational and professional lives in the lab. While it’s not a problem now, some of them overheard biased remarks in previous research positions– for instance, male grad students with children and stay-at-home wives expressing skepticism about whether women should be having children while in grad school. Others witnessed them at conferences. Lewis completed her undergraduate degree at all-women Mount Holyoke. While considering applying to the Cohn lab, she was more resistant to its location in the South than the prospect of working under a male PI. Cohn provides professional development guidance to help his female researchers deliberate how much they want to “lean in,” and how best to go about it. Questions like when to have kids, and how to strike a balance between working and making time for a home life. These were issues he had never had to consider in the way they would, and he didn’t feel comfortable stepping out blindly in advising them. So he brought in someone who could. He asked a few female colleagues to visit his lab meetings, discuss their careers and take questions. In spite of the challenges, Larkins said she hopes to become a university faculty member and have her own lab. While some might be tempted to assume a predominately-female lab would succumb to homogeneity, Gredler said the intellectual diversity in the lab has enhanced her work. While referencing the graph-lined pages of her scrupulously tidy notebook, she says the multiple focuses of the lab have broadened her thinking. (L-R) Kelsey Lewis, Christine Larkins and Marissa Gredler examine a clay model. Double-dipping, she has studied both the molecular genetics of urethral tube closure in mammals, as well as mechanisms by which those processes have evolved in non-mammalian species. Gredler said gender dynamics in the lab are so positive that she hadn’t ever given them a thought until she was approached to discuss them for this publication. However, public reminders of professional prejudice, such as the Tim Hunt debacle, serve as jarring reminders that not everyone’s workplace is as idyllic as this. “We don’t want to disregard real examples of gender related issues affecting people negatively,” Gredler said. Even hierarchy in terms of seniority is discouraged. If an undergraduate assistant knows how to perform a technique better than a post-doc, the elder researcher is expected to respectfully learn from them. Whether in spite of, or because of, its composition the Cohn Lab is one of the more prolific at the University of Florida. Six of the graduate students, and all of the post-docs, received competitive fellowships from NIH, NSF or HHMI, and the researchers routinely have papers published in prestigious journals such as Nature, Proceedings of the National Academy of Sciences, and Development. 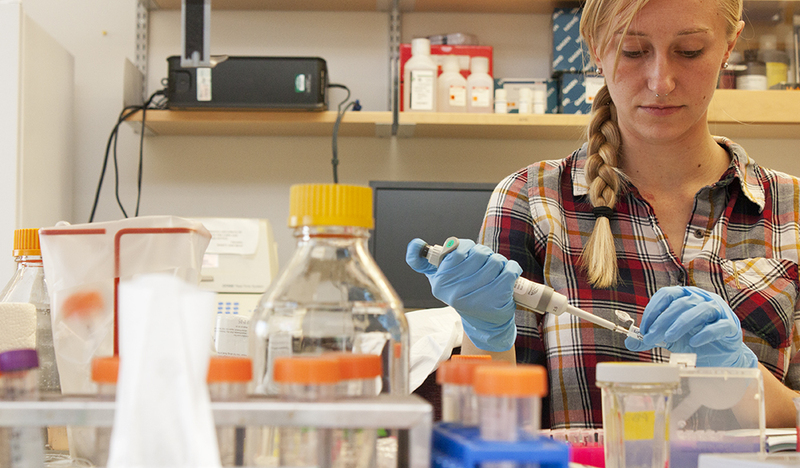 Larkins received a NIH K01 Mentored Research Scientist Development Award during the spring of 2015, and leads her own small group within Cohn’s lab.